Chipmunks are generally depicted as cute little creatures with their paws up to their mouths filling those cheeks full of nuts. However, if you’re gardener you know the chipmunk can be quite a nuisance! They are often quite destructive little rodents, digging holes, eating your flowering bulbs, and making various messes around your lawn and gardens. The little rodents may even enter your home in search of shelter from the cold. Chipmunk control is essential before they ruin your landscape or do damage to your home. Chipmunks live in burrows beneath the ground, hence all the messy holes in you gardens and lawn. Each “nest” houses multiple chipmunks, and is quite extensive with separate chambers for food storage, sleeping, and reproduction. Chipmunks breed in the spring and summer. 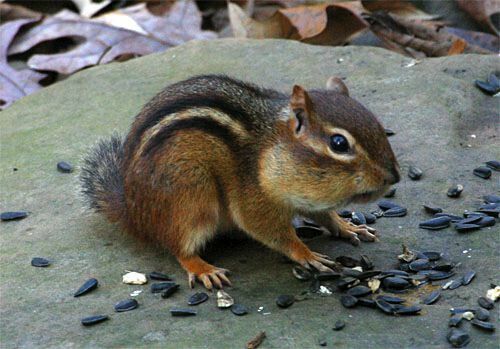 A typical “litter” is 4-5 babies each season, which equates to 8-10 new chipmunks per year. So, as you can see, it doesn’t take a lot of chipmunks to begin a big problem so early chipmunk control is essential or you run the risk being overrun! Chipmunks typically eat nuts, berries, seeds, and grains. However they also eat tender plant shoots, leaves, and flowering bulbs. This is where the chipmunk can become especially annoying, you plant new bulbs they dig them up, you plant new plants they eat them, and so on. They can become especially annoying in the fall as they stock pile food for the long winter. Be careful not to mistake chipmunk damage for squirrels and voles. Chipmunks are typically diggers, looking for roots and tubers. They also eat young shoots and leaves. You will often find chipmunks gathering seeds from underneath birdfeeders, and even emptying a birdfeeder if it hangs to low (I have personal experience here!). There are a few control options that we recommend, a couple easy options, and one not so easy. I don’t usually plug products, but I will in this case. Havahart® has a line of animal repelents called Critter Ridder®. Critter Ridder® is available in many forms including, spray, granular, or concentrate. This product works great, and it’s also compliant for use in organic gardening. This is pretty self-explanatory, there are many motion activated sprayers (pretty much a sprinkler), that is meant to scare away the animals. I find this works better with larger animals such as deer & dogs, but nonetheless it is an option. Live trapping is an effective chipmunk control solution in those cases in which chipmunk population is small. Chipmunks can squeeze through some traps that do not have a tight mesh pattern. Make sure that the trap you are using is recommended for chipmunks. Check the route that chipmunks use more often and set the trap in the appropriate place. Do not leave the chipmunk in the trap overnight as they are nervous animals and may die. Check the trap often and if in agreement with local and state laws, release the chipmunk in a suitable habitat at least 5 miles away. Bait Recommendations: Prune pits, unroasted peanuts, corn, sunflower seeds, peanut butter, cereal, grains, popcorn & bird food. As always, don’t forget to sign up over there to the right, for weekly TUFF GUARD brand updates, gardening tips, and just a cool story here and there!!! This entry was posted in Gardening Tips, Homeowner, Landscaping, Uncategorized and tagged Bill Murray, Caddyshack, Chipmunk, Garden, Home and Garden, Plant, Shopping, Sunflower seed. Bookmark the permalink.